LPE 16mm CW Superlight Carbon Fibre Suppressors are now available at a reduced price without an additional 14mm CW threaded cap, foam filled versions were £50.00, now just £42.00 + P&P or £40.00 + P&P without any silencing foam. Very limited stock available, no more will be made once these have sold out! Worldwide shipping is just £1.80. "These suppressors are an extremely limited run item that is directly threaded as 16mm CW for use on the KSC/KWA/Umarex USP Tactical, KWA Kriss Vector and Tokyo Marui Mk23 SOCOM Fixed Slide without an adapter. 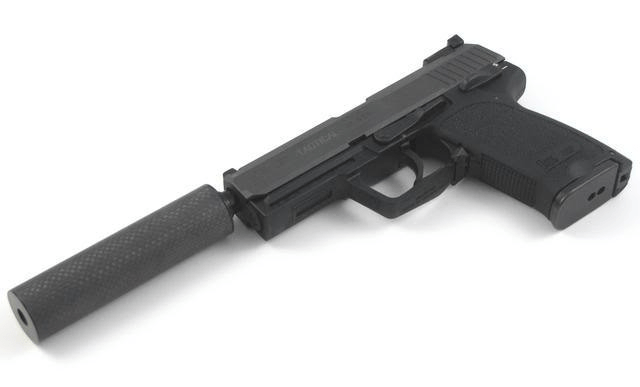 It is a well known fact that adding a suppressor onto many of the common types of GBB pistols will lead to reduced performance and slide cycle speed, while there are suppressors that claim to be ‘light weight’ available the reduction in performance can still create the need for upgrades to counter the additional weight added onto the barrel. The Lees Precision Engineering carbon fibre suppressors have been designed to be as light as an airsoft suppressor can be in order to reduce the negative impact on performance, they are not just light, they are super light!